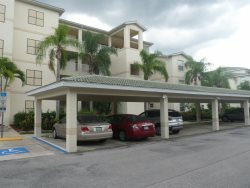 This is a Beautiful 2 Bed 2 Bath condo located on the popular gated golf community of Pelicans Preserve, it has a modern open floor plan and is professionally decorated to a high standard. Large open kitchen with island, granite counter tops, and stainless steel appliances. Covered carport with private parking space plus open parking. Master King Bedroom, Free WIFI and fully equipped with all your needs for extended stays. Pelican Preserve is a 55+ active adult golf community with one of the largest recreational complexes in southwest Florida. This gated Florida real estate development encompasses 27-holes of Chip Powell designated golf and a village like town center with 70,000 square feet of recreational facilities at Pelican Preserves Lake side town center, Plaza Del Sol. From tennis courts, pickle ball, softball, lawn bowling, movie theater, outside amphitheater and a fitness center to indoor and outdoor swimming pools and community space for games, crafts, movies and other social activities. The development also features freshwater lakes, a fishing pier and a boardwalk nature trail through a 38 acre preserve.